The West Windsor Bicycle and Pedestrian Alliance will be at West Windsor’s National Night Out event on Tuesday, Aug. 2. This will be from 5 p.m. to 9 p.m. at Community Park, rain or shine, and is being put on by the West Windsor Police Department. 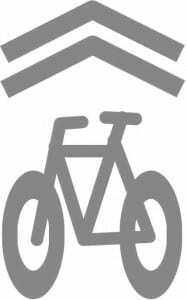 The WWBPA will be talking bike and pedestrian safety and will have a drawing with plenty of bike and pedestrian-related goodies for those who take our bike safety quiz. The police are promising music, inflatable bounce houses, a dunk tank, food, dance performances, a magician, a face painter and a pony ride. Many other community groups, including police, fire, K-9 and rescue services, will be represented. Sharrows, or shared lane markings, will be installed next month on roadways in the two Princetons. The thermoplastic markings will allow cyclists and drivers to safely “share the road” along the area’s streets that are too narrow for separate bike lanes. 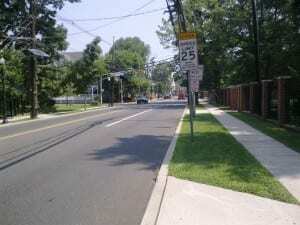 Nassau Street will be marked from Route 206 to Snowden Lane. 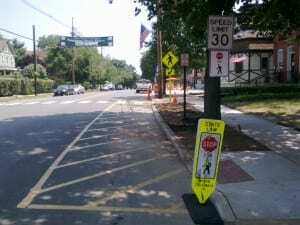 Markings will also be placed on Wiggins Street and Hamilton Avenue in the borough. 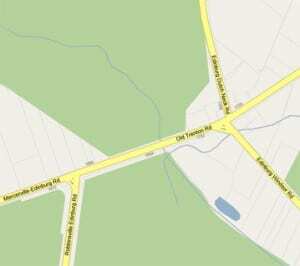 In the township, the markings will be placed on Harrison Street to Mount Lucas Road. Harrison and Witherspoon Street will be marked their entire lengths. A maximum of 87 symbols will be installed in the borough; and the State Department of Transportation will install additional 60 on Nassau Street. Approximately 72 will be installed on the township roadways. The borough’s share of the installation costs is $14,800. The township is paying the remainder of the $29,920, or $14,400. Each symbol costs about $170. The actual number of symbols that end up being installed will determine final cost. 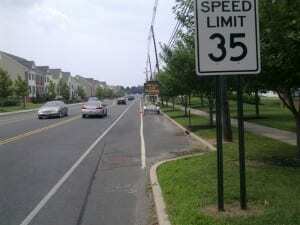 Traffic Lines Inc. of Farmingdale will be doing the work for the two municipalities. We’re tackling the Rogers Preserve trails on Sunday (July 31) and could use your help. Yes, your kids’ help too. To beat the heat, we’ll start at 9 a.m., meeting across from 17 Landing Lane. Plenty of street parking. 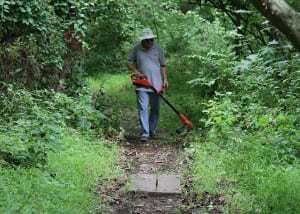 Bring loppers, weed-whackers and anything else that will help cut back overgrowth and weeds. There will be plenty of shade, but still, don’t forget water! 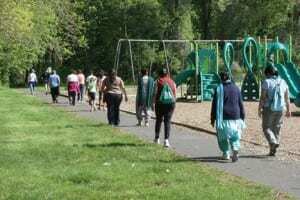 These trails were developed by the West Windsor Bicycle and Pedestrian Alliance and Friends of West Windsor Open Space. Don’t know the trails? This is a great way to discover them. Are you involved with a scout troop? This is a great group activity. Let us know if you’d like to co-organize another trail day. Mercer County plans to add a left turn lane from Old Trenton Road onto Edinburg Road as part of a bridge reconstruction project on Old Trenton Road that could happen next year. The road will be slightly widened to accommodate the 450-foot lane, which traffic engineers say should ease the flow of traffic on this road. No other changes are planned for this intersection, which is popular with cyclists. The bridge that will be reconstructed is on Old Trenton Road between Edinburg Road and Robbinsville Road. 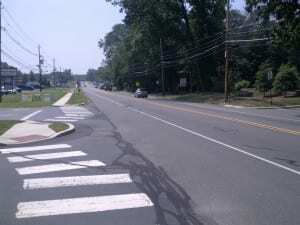 As part of the work, a sidewalk will be added on the north side of the bridge (in the event that sidewalks are ever installed in front of the homes there), bicycle-compatible shoulders will be added on both sides of parts of Old Trenton Road between the intersections and a traffic light will be installed at the intersection of Old Trenton Road and Robbinsville Road. The project will improve safety by replacing an elderly bridge and will set the precedent for accommodating bikers and walkers in the future whenever other improvements are made to Edinburg Village. 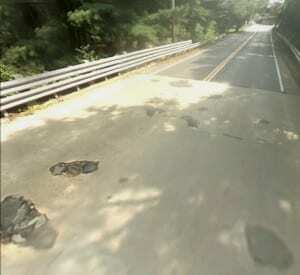 Parts of Old Trenton Road could be closed for six months while the work is done. Here are the answers to the Mercer County Main Street quiz! 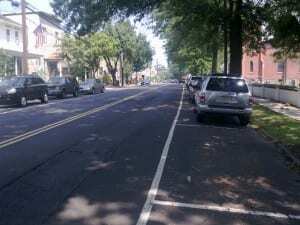 This picture tour of other towns’ main streets is intended to better illustrate what West Windsor’s own Main Street will look like after the project is completed. View: North on CR 640 (S. Main St.) from the church cemetery near Delaware Ave intersection. View: North on US 206 from the driveway of the Lawrenceville School near the intersection of Craven St.
View: West / North on SR 33 from east of STS Tire store near George Dye Rd. Streetscape: strip mall and individual commercial properties with parking lots typically in front, illustration shows banners, decorative lighting, new stores presumably built to the sidewalk as Chase Bank has done and Rite Aid is doing. 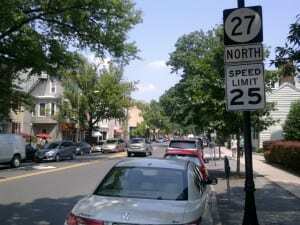 So which other Mercer County town’s Main Street will most resemble West Windsor’s proposed design? 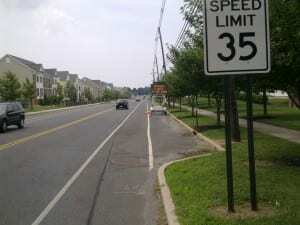 Only Hamilton and Robbinsville have a two way center left turn lane in their main streets, and Hamilton’s streetscape more closely resembles West Windsor, rather than the new Downtown Robbinsville development. 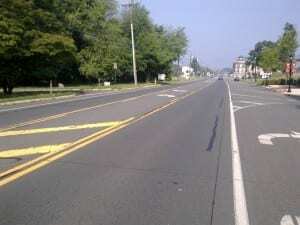 So Hamilton’s Main Street (Picture 7) is what we in West Windsor have to look forward to. Why would we want this design for our Main Street? Lawrenceville’s US 206 handles nearly the same volume at much lower speeds, and even Pennington’s arterial SR 31 handles more volume at lower speeds, and without a 3 lane design. 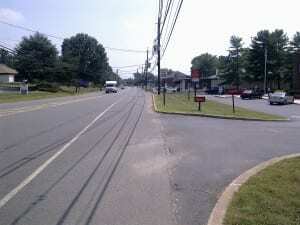 Today’s roadway is more like the Main Streets of other Mercer County towns than is the proposed design. Please see the WWBPA’s recommendations for CR 571, and contact our public officials to express your support for these design changes – this project is the best chance we’ll have in many years to create a Main Street that we can be proud of! Are We a Bicycle-Friendly Community? 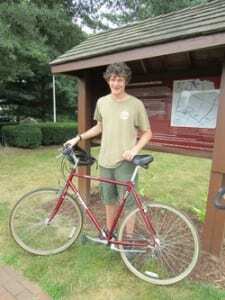 West Windsor’s government, with the help of the West Windsor Bicycle and Pedestrian Alliance, has submitted its application to become a bicycle-friendly community. The WWBPA is delighted and is excited to find out how we rate. We’re expecting to hear this fall. What is a bicycle-friendly community? This is a program from the League of American Bicyclists that judges how a community fares across what it calls the Five Es: Engineering, Education, Encouragement, Enforcement, and Evaluation & Planning. We believe West Windsor has made great strides in recent years by adding miles of bike lanes and creating the Trolley Line Trail. BikeFest is another important contributor to our bicycle-friendliness. The West Windsor Police, among other things, was a visible supporter of the Ride of Silence held in May. And of course, the WWBPA not only consistently advocates for bicycle-friendly roads but has installed bike racks and lockers and is constantly encouraging and educating cyclists (and motorists). 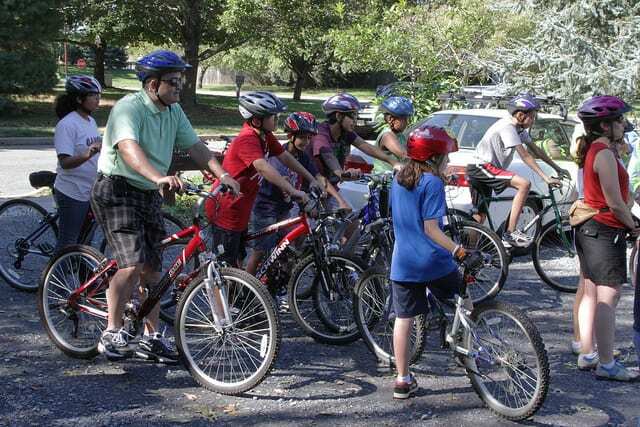 The latest example of our education efforts, of course, was our wildly successful “learn to bike” class in May that got about 50 kids off training wheels and enjoying the freedom of two wheels. The highest award is platinum, followed by gold, silver and bronze. There also is an “honorable mention” category, which isn’t quite bicycle-friendly. 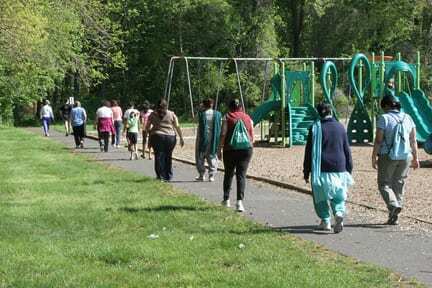 So far, no New Jersey community has done better than an honorable mention. We hope West Windsor will. Even getting this far would not be possible without the support of all our members. We thank you. Comments Off on Are We a Bicycle-Friendly Community? We now have a video of our fantastic day in May when we taught about 50 kids to ride without training wheels. Watch it! The next class will be Sept. 24. Watch for details. The WWBPA’s monthly meeting on Thursday will start at 6:30 p.m., 30 minutes early, so that we can briefly go to the informational meeting on Old Trenton Road at 7 p.m. before resuming with our meeting. Both meetings are in the West Windsor Municipal Building. Representatives from the Mercer County Department of Transportation and Infrastructure will present plans for the Old Trenton Road (CR 535) Bridge replacement project and answer questions at 7 p.m. Thursday, July 14 in Room D (downstairs) of the West Windsor Municipal Building. 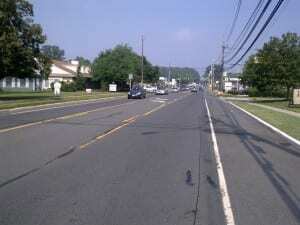 Plans for the replacement of the bridge over the Assunpink Creek call for a turn lane and signal controlled intersection with Robbinsville-Edinburg Road (CR 526) southbound and a turn lane at Edinburg Road northbound. The turn lane will allow the smooth movement of traffic as well as a queuing lane for those cars turning between the two signals. The design provides a single lane in each direction with a dedicated left turn lane which, due to long queues of left turning vehicles at both intersections, would extend across the new bridge. The design is documented in the West Windsor and Mercer County Master Plans available at the Municipal building. The West Windsor Bicycle and Pedestrian Alliance wants to ensure the plan also is friendly for bicyclists and pedestrians. The National Highway Traffic Safety Administration’s new Walk and Bike Safely beginning-level curriculum is designed for adult English language learners and is a useful tool for teachers or volunteers working with adult immigrants who are learning English. The product is in English and uses a more pictorial approach than the previously posted Intermediate level curriculum on the same subject matter. 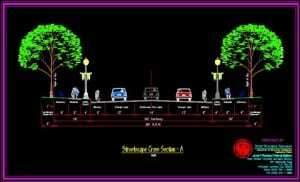 Walk and Bike Safely consists of six lessons each covering a different safety message. Both the beginning-level and intermediate-level curriculum can be accessed from either NHTSA’s pedestrian or bicycle Web sites. Walking, Biking ‘Not in the Federal Interest’? Key Congressional leaders are attacking Transportation Enhancements, Safe Routes to School, and Recreational trails and are taking steps to cut off dedicated federal funding for bicycling and walking. House Transportation Chairman John Mica (R-FL) announced today that his transportation bill will eliminate dedicated funding for bicycling and walking, including Transportation Enhancements, Safe Routes to School and the Recreational Trails Program, and discourages states from choosing to spend their dollars on these activities that are “not in the federal interest.” Chairman Mica’s statement that these programs remain “eligible” for funding is worthless; without dedicated funding for these three programs, they are effectively eliminated. Things on the Senate side are not much better. Senator James Inhofe (R-OK), the lead Republican negotiator on the transportation bill, declared that one of his TOP THREE priorities for the transportation bill is to eliminate ‘frivolous spending for bike trails.’ This is in direct conflict with Senator Barbara Boxer’s (D-CA) commitment to maintain dedicated funding for biking and walking. However, the Senate is working towards a bi-partisan solution, and Senator Inhofe’s comments mean funding for bicycle and pedestrian programs is at risk of total elimination. Help protect Transportation Enhancements, Safe Routes to School and Recreational Trails. 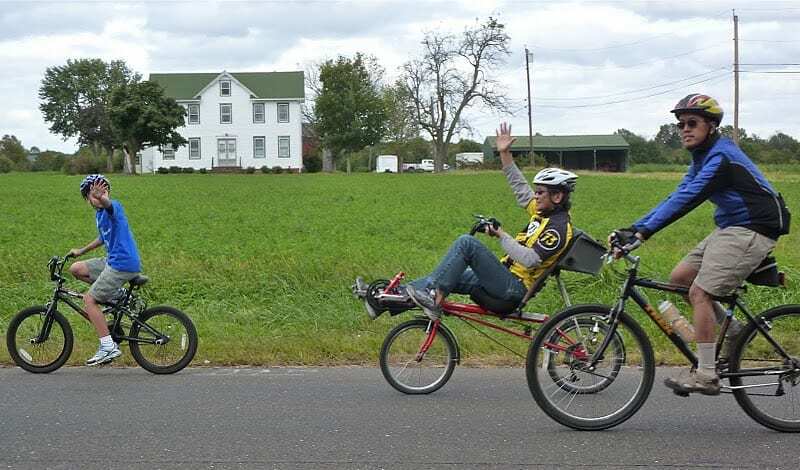 Contact your Members of Congress and tell them to reach out to Senators Inhofe, Boxer, and Congressman Mica to urge them to continue funding for these important bicycling and walking programs. Not in the federal interest? Biking and walking make up 12 percent of all trips in the US – even as funding for biking and walking projects only accounts for 1.5% of the federal transportation budget. That is more than 4 billion bicycle trips and 40 billion walking trips a year, including trips to work, school, shopping and for recreation and tourism. Frivolous? Two-thirds of all pedestrian deaths are on federally funded highways. One-third of children’s traffic deaths happen when children are walking or bicycling and are struck by cars. Bicycling and walking programs build sidewalks, crosswalks and bikeways—improving accessibility and saving lives. Biking and walking are important forms of transportation, and funding for bicycle and pedestrian improvements is a very efficient use of federal transportation dollars. Portland, OR built 300 miles of bike lanes and trails for the cost of one mile of highway. These projects create jobs and build local economies. Building bicycle and pedestrian infrastructure creates 46% more jobs than building road-only projects per million dollars spent. Cities that invest in bicycle and pedestrian projects turn downtowns into destinations, and capitalize on increased business activity. Eliminating the 1.5% of transportation funding spent on bike/ped would have no meaningful impact on the federal budget, but instead, decreases transportation options for American families in a time of rising gas prices and an uncertain economy. Why Act Now? Both the House and Senate long-term transportation bills are being written as we speak. We still have a chance of influencing the outcomes. Let’s make sure that funding for biking and walking programs don’t disappear for many years. We need every Senator to tell Senators Boxer and Inhofe that bicycling and walking are vital parts of our transportation system, and that there must be dedicated funding for sidewalks, bike lanes and trails to ensure that bicyclists and pedestrians are safe. And we need every Representative in the House to tell Chairman Mica the same. Please contact your Senators and Representatives TODAY to tell them that bicycling and walking are a critical part of a safe and equitable transportation system. Ask them to tell Representative Mica and Senators Boxer and Inhofe that a federal transportation bill must continue dedicated funding for bicycling and walking. You can find more ideas on what to say here. Comments Off on Walking, Biking ‘Not in the Federal Interest’? The WWBPA does a lot of work to make sure that West Windsor is friendly for bicycling and walking, but we also realize that many people want to bike to West Windsor from neighboring communities, and the best route isn’t always the same one they would use with a car.